© 2011 Jose et al; licensee BioMed Central Ltd. This is an Open Access article distributed under the terms of the Creative Commons Attribution License (http://creativecommons.org/licenses/by/2.0), which permits unrestricted use, distribution, and reproduction in any medium, provided the original work is properly cited. Background: Few studies have investigated factors that influence physical activity behavior during the transition from adolescence to adulthood. 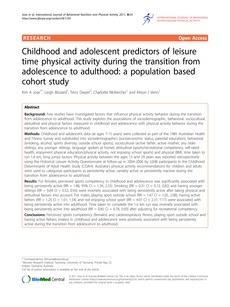 This study explores the associations of sociodemographic, behavioral, sociocultural, attitudinal and physical factors measured in childhood and adolescence with physical activity behavior during the transition from adolescence to adulthood. Methods: Childhood and adolescent data (at ages 7-15 years) were collected as part of the 1985 Australian Health and Fitness Survey and subdivided into sociodemographics (socioeconomic status, parental education), behavioral (smoking, alcohol, sports diversity, outside school sports), sociocultural (active father, active mother, any older siblings, any younger siblings, language spoken at home), attitudinal (sports/recreational competency, self-rated health, enjoyment physical education/physical activity, not enjoying school sports) and physical (BMI, time taken to run 1.6 km, long jump) factors. Physical activity between the ages 15 and 29 years was reported retrospectively using the Historical Leisure Activity Questionnaire at follow-up in 2004-2006 by 2,048 participants in the Childhood Determinants of Adult Health Study (CDAH). Australia’s physical activity recommendations for children and adults were used to categorize participants as persistently active, variably active or persistently inactive during the transition from adolescence to adulthood. Results: For females, perceived sports competency in childhood and adolescence was significantly associated with being persistently active (RR = 1.88, 95% CI = 1.39, 2.55). Smoking (RR = 0.31 CI = 0.12, 0.82) and having younger siblings (RR = 0.69 CI = 0.52, 0.93) were inversely associated with being persistently active after taking physical and attitudinal factors into account. For males, playing sport outside school (RR = 1.47 CI = 1.05, 2.08), having active fathers (RR = 1.25 CI = 1.01, 1.54) and not enjoying school sport (RR = 4.07 CI = 2.31, 7.17) were associated with being persistently active into adulthood. Time taken to complete the 1.6 km run was inversely associated with being persistently active into adulthood (RR = 0.85 CI = 0.78, 0.93) after adjusting for recreational competency. Conclusions: Perceived sports competency (females) and cardiorespiratory fitness, playing sport outside school and having active fathers (males) in childhood and adolescence were positively associated with being persistently active during the transition from adolescence to adulthood.